Samsung may have taken the microSD card slot out of the Galaxy S6 and Galaxy S6 Edge, but it didn't remove the microUSB port. Luckily for us, both new Galaxy devices support USB On The Go (OTG), microSD card readers and USB thumb drives with microUSB connections so we have a few options up our sleeves. This is the most obvious storage solution for the Galaxy S6: if Samsung won't give you a dedicated slot for a microSD card, then just use the USB port to attach a microSD card reader and carry on as usual. This is a great solution for keeping your music library from using up valuable space or for keeping your photos separate from your phone in case of an accident or theft. We like the Leef Access (12.99 USD via Leef's website) because it has a spare slot for another microSD card, but the MeenOva Dash Micro is equally great and seriously small, complete with key clip and regular USB adapter. It will cost you 12 USD plus 3 USD for shipping from MeenOva. Another great option is a dual-USB drive: with both regular-sized and micro USB ends. This means you can use it like a microSD card reader, for accessing content stored off your phone, but you can also use it for transferring files between your S6 and your laptop. There are plenty of versions available but our favorites are SanDisk's Dual USB OTG 64 GB Flash Drive for around 28 USD on Amazon (or you can grab a 64 GB USB 3.0 version for 36 USD on Amazon) and the 16 GB Leef Bridge 3.0 for it's ultra-compact size and sliding mechanism. The Leef Bridge 3.0 will set you back 30 USD for 16 GB, 40 USD for 32 GB and 70 USD for 64 GB via Leef's website. If you don't want to go out and buy a specific new gadget for expanding the Galaxy S6 storage, then you can go the DIY route and get back to basics at rock bottom prices. Simply pick up a USB OTG cable for a few bucks and connect any old USB stick to it. We've all got plenty of thumb drives floating around so there's no real outlay and the important part is the USB stick, not the cable. Not the most elegant solution, but definitely the cheapest. 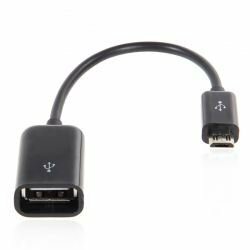 You can score a USB OTG cable on Amazon for as little as 1.24 USD. This isn't so much a storage solution as a storage workaround. Rather than carrying a USB cable around, you can pick up a cool and ultra-portable ChargeKey that will not only allow you to charge your S6 on the go but also quickly transfer files on or off your phone if you find yourself running out of storage. The ChargeKey will set you back 29 USD via the manufacturer's website or you can go super-cheap and just carry a short USB cable around in your pocket. Our friends at Leef have kindly given us five Leef Bridge 3.0 and five Leef Access storage solutions. We will give five lucky winners one Leef Bridge 3.0 and one Leef Access as a bundle to help ease the pain of losing microSD expansion in the Galaxy S6 (whether you own one or not). All you need to do is follow both AndroidPIT and Leef on Twitter (@AndroidPITcom and @Leef_UK) and send a tweet with the #S6storage hashtag telling us what you think of the removal of microSD from the S6 and S6 Edge. See below for conditions of entry. You've got until 1 PM EDT Friday 17 April, 2015 to send your tweet with the #S6storage hashtag. Only one tweet per Twitter handle will be eligible for entry. Entrants must be following @AndroidPITcom and @Leef_UK to be eligible. Entry is open to AndroidPIT readers from anywhere in the world. Once the competition deadline has passed, we will randomly choose winners and contact them via direct message on Twitter for their shipping details. Prizes will be sent out by the end of April. I would never buy another Samsung product after this experience. I was a dedicated Samsung guy with phones and TVs. The S6 phone has permanently caused me to switch away from all Samsung products. Unless Samsung decides to have a good customer service reputation and help those that purchased the S6, then I am a dedicated LG product person. If I wanted to have a confined amount of memory I would have purchased an iPhone. Thanks for the disappointment Samsung and providing a product that won't let me do my work. The easiest solution is to not buy any phone that has no card slot. I unfortunately bought my Galaxy S6 without realizing it has no card slot to increase memory. I don't download music or stuff, but my phone's memory is already full and i can't install apps. Recently, i received notic of a software update from T-mobile, but it won't install the update because of insufficient memory. The phone is less than 8 months old, but i've tossed it and bought an LG that has a memory slot. It's painful to just toss a $600+ phone less than 5 months old like that, but i've learned my lesson and will not buy a Samsung again until they bring back card slots and ability to remove batteries, which were the only reasons i initially preferred Samsung over the Iphone. Personally I think it would be wonderful if some tech gurus figured out a way to make a really small expansion card USB slot for our Galaxy 6s that we could just keep on our phones 24/7 without ever having to take off our expansion adapter ever. Even while charging. I put my cell in my front pocket and I don't like the look of expansion adapters so far. Too big and bulky with the added annoyance of having to plug the dang things in every time you wish to use your phone for various reasons. My idea is is to make a small "L" shaped attachment with a micro USB plugin protruding up from the bottom tip of this "L" and the back of the "L" has has a micro SD card slot in it. This way you'll always have your expanded me memory with it and fit it quite easily into front pocket. So the SD card slot we so need is comfly pressing up on the back bottom of the phone out of the way. And since SD.cards are so flipping thin in the first place it shouldn't cause any problems at all hugging the back bottom of any Galaxy S6. Of course I know that keeping it charged via the micro USB port would become problematic because of this and that altering my special SD card adapter to compensate for this would make this nifty little add on almost too big by itself to be practical for what we want to use it for. But I remember this device also has a wireless charger thing in it too I think. So that solves the problem about charging it. Innovating our ways out of problems is what humans do. And I think we're pretty good at that too. What are your thoughts on this if you have any? And also I don't mind explaining this idea of mine more clearly if it went over your head. Incipio make a case that has extra battery and a microusd slot for 89 bucks. Or I suppose I could just get an lg g4 with an otter box, if the hype is to be believed. great gadgets but on-board micro sd card slot is essential. I have been Loyal to Samsung. For the last 5 years I have stayed with Samsung and bought their Cell's for my wife and I. BUT, Samsung dooes not care about keeping Loyal customers. I love the fact that my Note 3 and my wifes S-3 have a removable Battery and sd micro, and I have always defended Samsung. Not any more. in fact I'm looking into the LG-G3. I have a friend who has one and he loves it. What's not to love.